Annan Athletic moved to the top half of the table for first time this season after recording another fine victory over promotion hopefulls Stenhousemuir at Ochilview on Saturday. It was another professional team performance following immediately after the victory over Elgin City from Peter Murphy’s team and it proved to be an inspiring afternoon for Blair Henderson who grabbed the headlines with a superb hat trick. Annan lined up with the same starting eleven as the previous week Stenhousemuir included recent emergency loan signing Alan Cook who had made the opposite move from Stenhousemuir to Alloa at the beginning of the season. Stenhousemuir started the game very positively taking the game to Annan with Cook making an impression in the 10th minute with an inviting ball across the face of the goal. Annan forced the first corner of the match minutes later. Annan had a lucky escape in the 15th minute when Alex Mitchell was forced to pull off a save to deny top scorer Mark McGuigan and in the 21st minute Mitchell pulled off a routine save from McGuigan’s header as the hosts pushed forward. Annan were dealt a blow in the 23rd minute when Swinglehurst had to leave the field injured to be replaced at the centre of defence by Scott Hooper. Sinnamon ended a promising move for Annan in the 28th minute with a low raking shot from 20 yards which slipped agonisingly wide of the post with the keeper at full stretch. 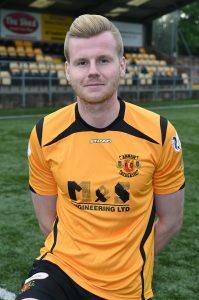 Annan looked comfortable defending and Cook’s 28th minute effort went into the arms of Mitchell followed by a Colin McMenamin shot which was blocked as Annan shut the effort down. As the half edged towards half time Sinnamon’s effort from the edge of the box went close going narrowly over the bar and McMenamin’s header was easily saved by Mitchell. The home team finished the half positively winning a free kick from 25 yards out but Cook’s effort failed to get past the Annan defensive wall. Martin Scott’s header at the start of the second half forced Mitchell to turn the header past for a corner kick and at the other end Aiden Smith’s cross brought out a good header from Henderson but in the 55th minute Annan’s best chance fell to Aiden Smith but the striker was denied by an excellent save from Smith. Following that Mitchell had to be alert to deny Cook in the 59th minute after a good move down the left. The home team broke the deadlock in the 70th minute and Cook was at the heart of the move when his well hit shot was only parried by Mitchell and McMenamin was in the right place to slot the ball over the line from close range. Annan’s response was immediate with a superbly worked move down the left flank involving Creaney, Smith and Ferguson who carved open the home defence ending with a superbly weighted ball to Blair Henderson who finished the move with a shot across the keeper from 10 yards. Annan were on top now and minutes later Henderson should have grabbed his second but he screwed his shot wide of the post after another attacking move from Annan. It was a well contested game throughout and Stenhousemuir pushed to unlock the Annan defence, Cook won a free kick 25 yards out in the 75th minute but the effort was blocked and Donaldson’s dangerous cross to the near post was begging for someone to get a touch. Annan got their noses in front for the first time in the 80th minute when Moxon’s cross to the back post found Henderson powering in and his header came off the post and right back to the striker who slotted the ball over the line from close range. Stenhousemuir made a triple change in an effort to salvage something from the match and they threw everything at Annan in an effort to grab a lifeline. Crainey cleared the ball off the line as Annan held on to their goal advantage but in the final minute Annan secured the points when keeper Chris Smith failed to control a clearance on the half way line and Blair Henderson reacted quickly to win the ball and finished with a 30 yard low shot into the empty net. It was a fitting end for the striker who has had a difficult start on his return to the club but he showed all what he could offer and it goes part way to repaying the faith that the Annan management have shown in his ability as a striker. The victory pushes Annan close to the play off zone and although they have played more matches they are moving in the right direction. Annan face a couple of home matches in the next couple of weeks against Stirling Albion and Edinburgh City and these matches against two teams at opposite ends of the table will go a long way to deciding if Annan are capable of sustaining a push for one of the play off positions. STENHOUSEMUIR- Chris Smith, Ross Meechan (David Marsh 83 min) Michael Dunlop, Ross Dunlop, Ruaridh Donaldson (Edward Ferns 83 min), Mark Ferry, Mark McGuigan, Nicki Paterson (Jamie Longworth 83 min), Colin McMenamin, Martin Scott, Allan Cook. SUBS NOT USED- Lewis McMinn (GK), Ross Gilmour, Paul Allan, Innes Murray. ANNAN ATHLETIC-Alex Mitchell (GK), Jack Brannan, James Creaney, Owen Moxon, Peter Watson, Steven Swinglehurst (Scott Hooper 23min), Dan Orsi (Ayrton Sonker 85 min), Ryan Sinnamon, Aidan Smith, Blair Henderson, Rabin Omar (Ross Ferguson 60). SUBS NOT USED- Jim Atkinson (GK), Brandon Luke, Peter Murphy, Kevin Rutkiewicz. Referee- David Munro Assistants – Joseph Lawson, Robert Thomson. It was a day when the inclement weather caused the cancellation of the Stirling Albion v Cowdenbeath and the Peterhead v Clyde match. Montrose took advantage of the postponements and moved back to the top of the league with a 3 -0 victory over Berwick Rangers with all the goals coming in the opening 30 minutes. Edinburgh City were denied 3 points when Elgin City grabbed a last minute equaliser to secure a point in a match which ended 1-1.